The 1st and 2nd of Buddha’s Four Noble Truths are spot on in regards to the nature and the cause of humanity’s existential difficulties. While these first Truths are a no-brainer, the solution for our problem offered in his 3rd and 4th Noble Truths turn out to be far more subtle. It is a good deal easier to identify problems or questions than it is to recognize or apply truly effective solutions or answers. For example, if the river floods our town we can readily identify the nature and the cause of the problem. 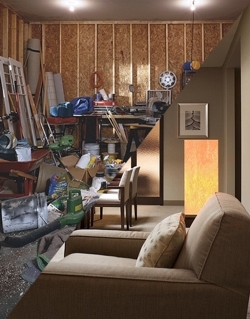 The short-term solution, clean up and rebuild, is as straightforward as it is temporary. The truly effective solution might be to move the town, but no one wants to let go and move… yet anyway. Solutions for humanity’s existential problems have run a similar course. Otherwise, the various political and religious solutions offered historically would have succeeded by now, i.e., we would have ‘moved the town’, so to speak. If anything, we are as far now from a truly effective solution as ever (1). Any answers or solutions humanity comes up with invariably lead to still more questions and problems. On top of that, the deeper we look into life’s challenges, the murkier everything looks. Our need for solutions drives us to jump at what feels like straightforward solutions, and we end up going round and round. We lack the real patience to follow the breadcrumb trail: questions beget answers…beget questions… beget answers… beget questions… ad nauseam almost. Our problem is internal and while it’s associated with our sense of self, the sense of self doesn’t cause the problem. The sense of self is innate and natural. I think of it as the survival sense that motivates all life to live out its days. Our ‘special’ problem is mostly due to thoughts of self. As chapter 7 says, Is it not because he is without thought of self that he is able to accomplish his private ends? Thinking enables each person to project this sense of self onto ‘my stuff, my beliefs, my future, my past, my life’. The Science News report, Kids own up to ownership, illustrates just how early and deep this attachment to ‘my stuff’ begins. This shows that science has come another step closer to proving a key element of Buddha’s Second Noble Truth, The kids in the article show how it begins with ‘my stuff’, and just goes on from there. Truly, “… the illusion of self originates and manifests itself in a cleaving to things”. WASHINGTON — Young children are possessed by possessions. Preschoolers argue about what belongs to whom with annoying regularity, a habit that might suggest limited appreciation of what it means to own something. But it’s actually just the opposite, psychologist Ori Friedman of the University of Waterloo in Canada reported on May 28 at the Association for Psychological Science annual meeting. At ages 4 and 5, youngsters value a person’s ownership rights — say, to a crayon — far more strongly than adults do, Friedman and psychology graduate student Karen Neary found. Rather than being learned from parents, a concept of property rights may automatically grow out of 2- to 3-year-olds’ ideas about bodily rights, such as assuming that another person can’t touch or control one’s body for no reason, Friedman proposed. (1) The impetuous way humanity jumps at what feels like straightforward solutions may improve as the mean age of humanity rises over the coming millennia. The mean age was in the teens during Roman times, and even up through the 19th century. Now, it is 36 plus in the developed world. An aging population is less aggressive and impulsive than a younger one, which alone helps mitigate part of humanity’s existential problem. At least we’ll have more patience to follow that breadcrumb trail of questions and answers. It is on this trail that the subtle solutions offered in Buddha’s 3rd and 4th Noble Truths become feasible.